First Selectman Kevin Moynihan and Boxcar CEO Joe Colangelo talk about Boxcar's uses for the town. NEW CANAAN — More downtown parking spaces are on the way. 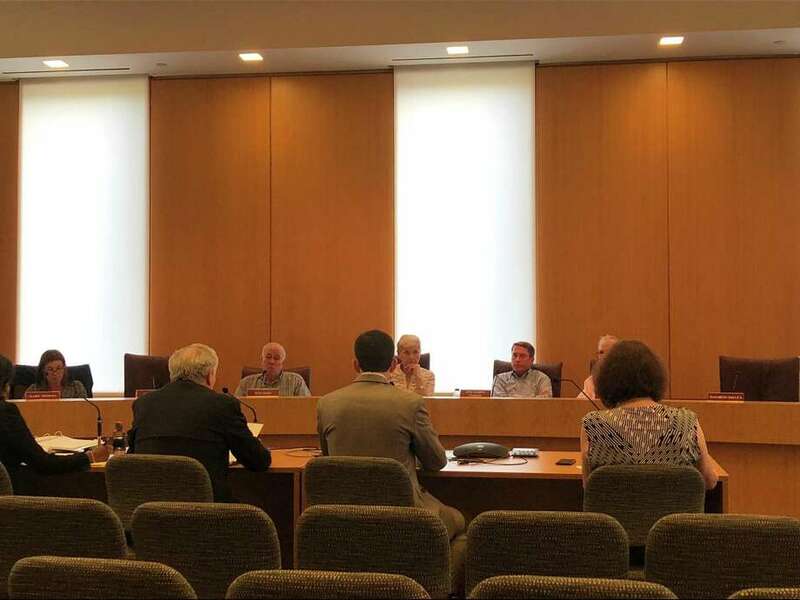 The Planning and Zoning Commission on Tuesday approved a six-month trial period for Boxcar, a Cranford, N.J.-based mobile application that partners with private property owners — such as funeral homes and churches — to help people book vacant spaces in their lots. With over 500 residents on the permit parking wait list and talks about parking lot expansion still in its early stages, town officials have turned to Boxcar to meet demand for spots. St. Aloysius Church at 21 Cherry St. is expected to be a pilot site, with approximately 60 spots available to book, according to First Selectman Kevin Moynihan and Boxcar CEO Joe Colangelo. Colangelo made his pitch to the commission during a Tuesday meeting, alongside Moynihan. Members of the commission had questions. To learn more about Boxcar, visit boxcarapp.com. Colangelo said the price for spots would be around $6 per day for a time frame that could range from 6 a.m. to 10 p.m. The mobile application takes 25 percent of the revenues from the parking fees and the rest goes toward the private property owner. Commissioner Dan Radman asked if landlords could change the price of a parking spot if they chose to partner with Boxcar. Moynihan suggested the Parking Department could work with St. Aloysius to police its Boxcar-operated parking spaces. “If we discover any problems, we will ask Boxcar to reduce the number (of spots) and manage it based on local knowledge,” Moynihan said.